Nikbakht, M., Gholami, A., Morowvat, M., Ghasemi, Y., Mohagheghzadeh, A. (2016). Analysis of volatiles and 18S rRNA gene of Haplophyllum canaliculatum in in vitro cultures. 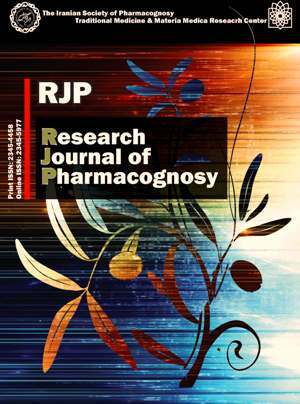 Research Journal of Pharmacognosy, 3(4), 17-25. M. Nikbakht; A. Gholami; M.H. Morowvat; Y. Ghasemi; A. Mohagheghzadeh. "Analysis of volatiles and 18S rRNA gene of Haplophyllum canaliculatum in in vitro cultures". Research Journal of Pharmacognosy, 3, 4, 2016, 17-25. Nikbakht, M., Gholami, A., Morowvat, M., Ghasemi, Y., Mohagheghzadeh, A. (2016). 'Analysis of volatiles and 18S rRNA gene of Haplophyllum canaliculatum in in vitro cultures', Research Journal of Pharmacognosy, 3(4), pp. 17-25. Nikbakht, M., Gholami, A., Morowvat, M., Ghasemi, Y., Mohagheghzadeh, A. Analysis of volatiles and 18S rRNA gene of Haplophyllum canaliculatum in in vitro cultures. Research Journal of Pharmacognosy, 2016; 3(4): 17-25. 1Pharmaceutical Sciences Research Center, School of Pharmacy, Shiraz University of Medical Sciences, Shiraz, Iran. Department of Pharmacognosy, School of Pharmacy, Shiraz University of Medical Sciences, Shiraz, Iran. 2Department of Pharmacognosy, School of Pharmacy, Shiraz University of Medical Sciences, Shiraz, Iran. 3Pharmaceutical Sciences Research Center, School of Pharmacy, Shiraz University of Medical Sciences, Shiraz, Iran. 4Pharmaceutical Sciences Research Center, School of Pharmacy, Shiraz University of Medical Sciences, Shiraz, Iran.Department of Pharmaceutical Biotechnology, School of Pharmacy, Shiraz University of Medical Sciences, Shiraz, Iran. 5Pharmaceutical Sciences Research Center, School of Pharmacy, Shiraz University of Medical Sciences, Shiraz, Iran.Department of Pharmacognosy, School of Pharmacy, Shiraz University of Medical Sciences, Shiraz, Iran. Background and objectives: Haplophyllum canaliculatum isan endemicand endangeredIranian plant from Rutaceae family. The object of this work was to study the volatile production in established shoot and callus cultures of Haplophyllum canaliculatum as well as isolation, identification and sequencing of 18S rRNA gene from callus culture. Methods: Shoot and callus cultures of H. canaliculatum were established from seedlings and shoot cultures, respectively. Both cultures were transferred to MS medium supplemented with α-naphthalene acetic acid (α-NAA), 2,4-dichlorophenoxyacetic acid (2,4-D) and kinetin (Kn). Volatiles from fresh callus and shoot cultures were extracted and analyzed by GC/MS. For 18S rRNA gene study, DNA content was extracted using PCR procedure. The study of sequence similarities was performed using NCBI database and GeneDoc software. Results: GC/MS analysis of H. canaliculatum showed that shoot cultures mainly contained piperitone (10.92%), and β-caryophyllene (12.67%) in addition to three alkaloids, while calli cultures of H. canaliculatum mainly contained methylated salicylate (31.55%), alkane structures like tetradecane (24.31%) and hexadecane (12.95%). Gene analysis showed 98% homology with certain species of Rutaceae, Meliaceae, Simaroubaceae, Burseraceae and Cneoraceae. Conclusions: Our results showed that the hydrocarbon in addition to methyl salicylate biosynthetic pathway in calli cultures and terpene as well as alkaloid biosynthetic pathway were active in H. canaliculatum shoot cultures. Moreover, the obtained sequences could be used as a “DNA barcoding” tool through the concept of one sequence one species for the practical identification of this species. Townsend C. Taxonomic revision of the genus Haplophyllum (Rutaceae). West Sussex: Betham-Moxon Trustees, 1986. Al-Rehaily AJ, Al-Howiriny TA, Ahmad MS, Al-Yahya MA, El-Feraly FS, Hufford CD, McPhail AT. Alkaloids from Haplophyllum tuberculatum. Phytochemistry. 2001; 57(4): 597-602. Salvo G, Manafzadeh S, Ghahremaninejad F, Tojibaev K, Zeltner L, Conti E. Phylogeny, morphology, and biogeography of Haplophyllum (Rutaceae), a species-rich genus of the Irano-Turanian floristic region. Taxon. 2011; 60(2): 513-527. Al-Burtamani SKS, Fatope MO, Marwah RG, Onifade AK, Al-Saidi SH. Chemical composition, antibacterial and antifungal activities of the essential oil of Haplophyllum tuberculatum from Oman. J Ethnopharmacol. 2005; 96(1-2): 107-112. Azadi B, Khaef S. Volatile constituents of Haplophyllum buhsei Boiss. flowering aerial parts. Bull Chem Soc Ethiopia. 2015;29(2): 327-330. Mechehoud Y, Chalard P, Figueredo G, Marchioni E, Benayache F, Benayache S. Chemical composition of the essential oil of Haplophyllum tuberculatum (Forssk.) L.A. Juss. from Algeria. Res J Pharm BiolChem Sci. 2014; 5(5): 1416-1419. Rasulova KA, Kodirova DR, Bobakulov KM, Abdullaev ND. Griffithine, a new furanoquinolone alkaloid from: Haplophyllum griffithianum. Chem Nat Compd.2015; 51(4): 743-745. Di Giorgio C, Delmas F, Akhmedjanova V, Ollivier E, Bessonova I, Riad E, Timon-David P. In vitro antileishmanial activity of diphyllin isolated from Haplophyllum bucharicum. Planta Med. 2005; 71(4): 366-369. Ostan I, Saglam H, Limoncu ME, Ertabaklar H, Toz SO, Ozbel Y, Ozbilgin A. In vitro and in vivo activities of Haplophyllum myrtifolium against Leishmania tropica. New Microbiol. 2007; 30(4): 439-445. Varamini P, Doroudchi M, Mohagheghzadeh A, Soltani M, Ghaderi A. Cytotoxic evaluation of four Haplophyllum species with various tumor cell lines. Pharm Biol. 2007; 45(4): 299-302. Eissa TF, González-Burgos E, Carretero ME, Gómez-Serranillos MP.Biological activity of HPLC-characterized ethanol extract from the aerial parts of Haplophyllum tuberculatum. Pharm Biol. 2014; 52(2): 151-156. Zengin G, Sarikurkcu C, Aktumsek A, Ceylan R, Ceylan O.A comprehensive study on phytochemical characterization of Haplophyllum myrtifolium Boiss. endemic to Turkey and its inhibitory potential against key enzymes involved in Alzheimer, skin diseases and type II diabetes. Ind Crops Products. 2014; 53: 244-251. Mohamed A, Ali M, Bashir A, Salih A. Influence of Haplophyllum tuberculatum on the cardiovascular system. Int J Pharmacognosy. 1996; 34(3): 213-217. Prieto JM, Recio MC, Giner RM, Manez S, Massmanian A, Waterman PG, Ríos JL. Topical anti-inflammatory lignans from Haplophyllum hispanicum. Z Naturforsch C. 1996; 51(9-10): 618-622. Brooks GF, Jawetz E, Melnick JL, Adelberg EA. Jawetz, Melnick & Adelberg's medical microbiology. New York: McGraw-Hill, 2013. Rasoul-Amini S, Ghasemi Y, Morowvat MH, Ghoshoon MB, Raee MJ, Mosavi-Azam SB, Montazeri-Najafabady N, Nouri F, Parvizi R, Negintaji N, Khoubani S. Characterization of hydrocortisone bioconversion and 16S RNA gene in Synechococcus nidulans cultures. Appl Biochem Microbiol. 2010; 46(2): 191-197. Álvarez I, Wendel JF. Ribosomal ITS sequences and plant phylogenetic inference. Mol Phylogenet Evol. 2003; 29(3): 417-434. Salvo G, Bacchetta G, Ghahremaninejad F, Conti E. Phylogenetic relationships of Ruteae (Rutaceae): new evidence from the chloroplast genome and comparisons with non-molecular data. Mol Phylogenet Evol. 2008; 49(3): 736-748. Machado de Mello A, Streck NA, Blankenship EE, Paparozzi ET. Gibberellic acid promotes seed germination in Penstemon digitalis cv. husker red. Hortscience. 2009; 44(3): 870-873. Murashige T, Skoog F. A revised medium for rapid growth and bioassays with tobacco tissue cultures. Physiol Plantarum. 1962; 15(3): 473-497. Mohagheghzadeh A, Shams‐ArdakaniM, GhannadiA. Volatile constituents of callus and flower‐bearing tops of Zataria multiflora Boiss. (Lamiaceae). Flav Fragr J. 2000; 15(6): 373-376. Ghasemi Y, Khalaj A, Mohagheghzadeh A, Khosravi AR, Morowvat MH.Composition and antimicrobial activity of the essential oil and extract of Hypericum elongatum. JAppl Sci. 2007; 7(18): 2671-2675. Adams R. Identification of essential oil components by gas chromatography/quadrupole mass spectroscopy. Allured: Carol Stream, 2001. Ghasemi Y, Abedtash H, Morowvat MH, Mohagheghzadeh A, Ardeshir-Rouhani-Fard Sh.Essential oil composition and bioinformatic analysis of Spanish broom (Spartium junceum L.). Trends Pharm Sci. 2015; 1(2): 97-104. Ghasemi Y, Mohagheghzadeh A, Ostovan Z, Moshavash M, Rasoul-Amini S, Morowvat MH. Biotransformation of some monoterpenoid ketones by Chlorella vulgaris MCCS 012. Chem Nat Compd. 2010; 46(5): 734-737. CLC Bio, QIAGEN company, CLC Sequence Viewer software 7.7. Venlo, 2016. Puricelli L, Innocenti G, Piacente S, Caniato R, Filippini R, Cappelletti EM. Production of lignans by Haplophyllum patavinum in vivo and in vitro. Heterocycles. 2002; 56(1-2): 607-612. Staerk D, Kesting JR, Sairafianpour M, Witt M, Asili J, Emami SA, Jaroszewski JW. Accelerated dereplication of crude extracts using HPLC–PDA–MS–SPE–NMR: quinolinone alkaloids of Haplophyllum acutifolium. Phytochemistry. 2009; 70(8): 1055-1061. Webb JK, Banthorpe DV, Watson DG. Monoterpene synthesis in shoots regenerated from callus cultures. Phytochemistry. 1984; 23(4): 903-904. Kintzios S. Secondary metabolite production from plant cell cultures: the success stories of rosmarinic acid and taxol. In: RamawatKG and MerillonJM. Eds. Bioactive molecules and medicinal plants. Berlin Heidelberg: Springer, 2008. Shulaev V, Silverman P, Raskin I. Airborne signalling by methyl salicylate in plant pathogen resistance. Nature.1997; 385(6618): 718-721. Chase MW, Morton CM, Kallunki JA. Phylogenetic relationships of Rutaceae: a cladistic analysis of the subfamilies using evidence from RBC and ATP sequence variation. Am J Bot. 1999; 86(8): 1191-1199. Chen S, Song J, Sun C, Xu J, Zhu Y, Verpoorte R, Fan TP. Herbal genomics: Examining the biology of traditional medicines. Science. 2015; 347(6219): S27-S29. Biniyaz T, Habibi Z, Masoudi Sh, Rustaiyan A. Composition of the essential oils of Haplophyllum furfuraceum Bge. ex Boiss. and Haplophyllum virgatum Spach. from Iran. JEssentOil Res. 2007; 19(1): 49-51. Mohammadhosseini M, Nekoei M, Mashayekhi HA, Aboli J. Chemical composition of the essential oil from flowers, leaves and stems of Haplophyllum perforatum by using head space solid phase microextraction. J Essent Oil Bear Plants.2012; 15(4): 506-515. Javidnia K, Miri R, Soltani M, Varamini P. Volatile constituents of two species of Haplophyllum A. Juss. from Iran [H. lissonotum C. Town. and H. buxbaumii (Poir.) G. Don. subsp. mesopotamicum (Boiss.) C. Town.]. JEssentOil Res. 2009; 21(1): 48-51. Ulubelen A, Öztürk M. Alkaloids, coumarins and lignans from Haplophyllum species. Rec Nat Prod. 2008; 2(3): 54-69.